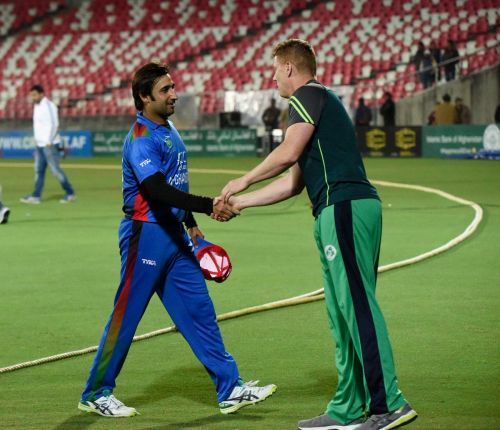 Afghanistan and Ireland are set to lock horns in the fourth ODI at Rajiv Gandhi International Cricket Stadium on Friday. After a string of defeats, Ireland bounced back in the third ODI to register their first victory of this tour. Afghanistan has to find a way now to win this ODI series with two more games remaining. Both the teams will battle it out once again at the same venue to take the lead in this wonderfully poised ODI series. Afghanistan faced a setback in their previous game against Ireland. Having won the toss, the Afghans opted to bat first and managed to post a competitive score on the board. Najibullah Zadran (104*) and Asghar Afghan (75) contributed with the bat and took their team to a challenging total of 256-8. With the ICC World Cup in sight, Afghanistan would be eyeing to win the remaining game to seal this ODI series. Their batting strength has been quite impressive in this tour while the bowling department has stepped up at the right time. After beating Afghanistan in the second ODI Ireland scripted a famous comeback in this series. The visitors must be delighted with their first victory of this Indian tour. Andrew Balbirnie was declared the Man of the Match for his unbeaten knock of 145 runs. George Dockrell (54) also played his part and stitched a match-winning partnership along with Balbirnie to take their side over the line with six balls to spare. Ireland would be hoping to keep this winning momentum in the remaining two games. Having lost the T20I series, the Irish will be desperate to perform well in the ODI series.